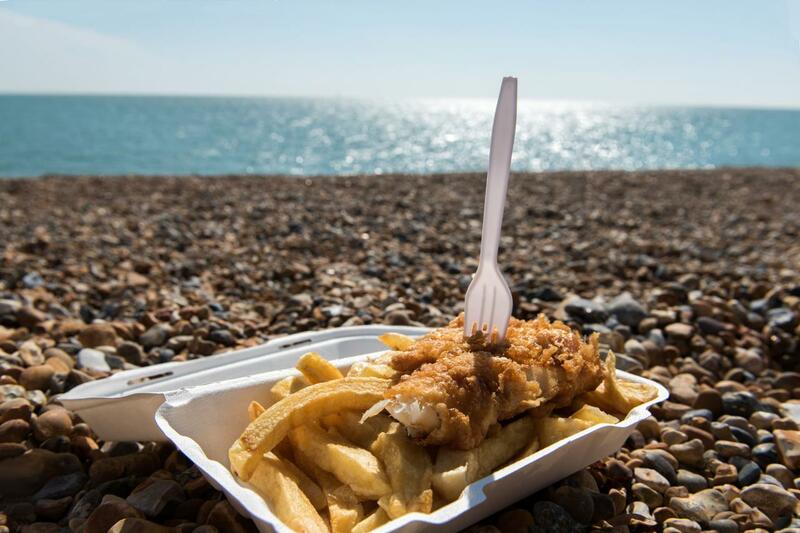 Try some of these iconic eats from beaches around the world. While fresh seafood is a universal beach snack, there’s so much more in the world of coastal street food. 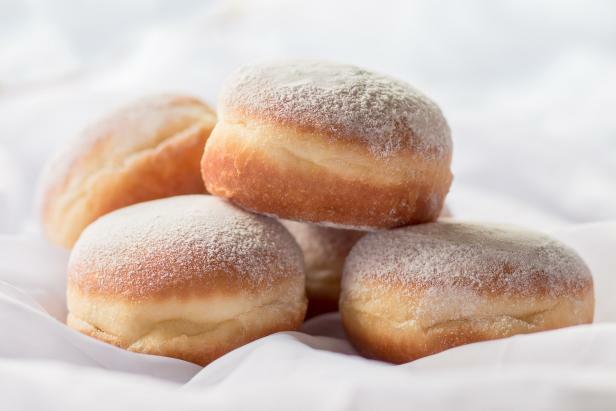 Some countries opt for doughnuts. Others put unusual fried things on a stick. You can’t visit these countries and their world-famous beaches without sampling these delicious seaside snacks. Cheese. On a stick. On the beach. This is what dreams are made of. Queijo coalho is nothing like fried cheese at the Iowa state fair. 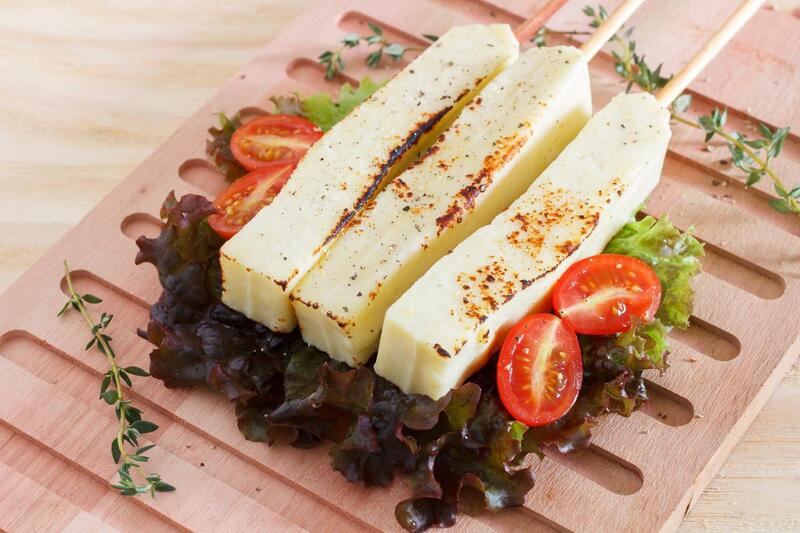 This light cheese is more like cheese curds and it’s barbecued on skewers. It’s cheap, delicious and sometimes comes with a sweet dipping sauce. 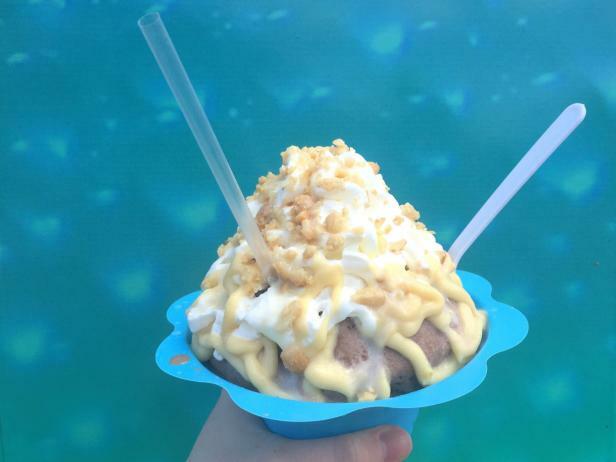 This icy treat is like a snow cone on steroids. It starts with shaved ice, then ice cream, then coconut milk, then boba, then flavored jellies and it gets crazy after that. I’ve seen chunks of fruit, caramelized bananas, sweet red beans and even corn flakes. It might seem like a random assortment of things but it’s a delicious adventure. Ask for a big spoon so you can get all the layers in one bite. There is a place where you can sit and eat doughnuts while you listen to the waves. And that incredible place is called Croatia. Krofne doughnuts are stuffed with jelly, custard and even Nutella. But it gets better. Vendors walk around the beach with fresh baked Krofne so you never have to get up. The batidos, a Spanish milkshake smoothie hybrid, is a must-try when visiting Curacao. This delicious icy drink is a Spanish milkshake smoothie hybrid made with frozen fruit, milk and sugar. After a swim in the hot sun, there is nothing more refreshing. It’s lighter than a milkshake but sweeter than a smoothie. Think of an Icee blended with cream. 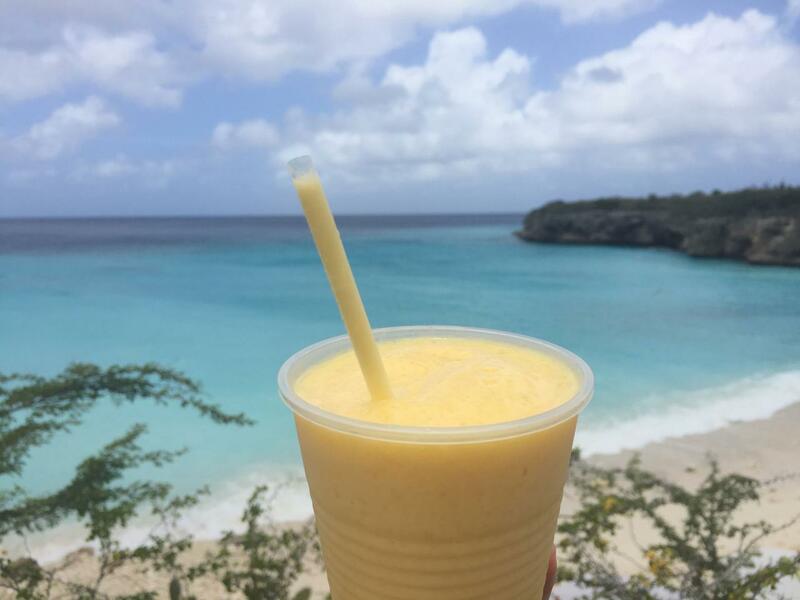 You can’t go wrong with tropical flavors like papaya, pineapple or—my favorite—mango. Three deep fried conch fritters, a specialty of the Florida Keys, served with lime and dipping sauce. This ocean critter is a spearfishing favorite in the Caribbean. And it’s delicious in so many ways. I’ve seen people spear it, cut it, toss it in lemon and leave it out on the back of the boat to cook in the sun in the citric acid. I’ve also had it scrambled like eggs. But the best way (and a great way to soak up pool drinks) to eat conch is fried. 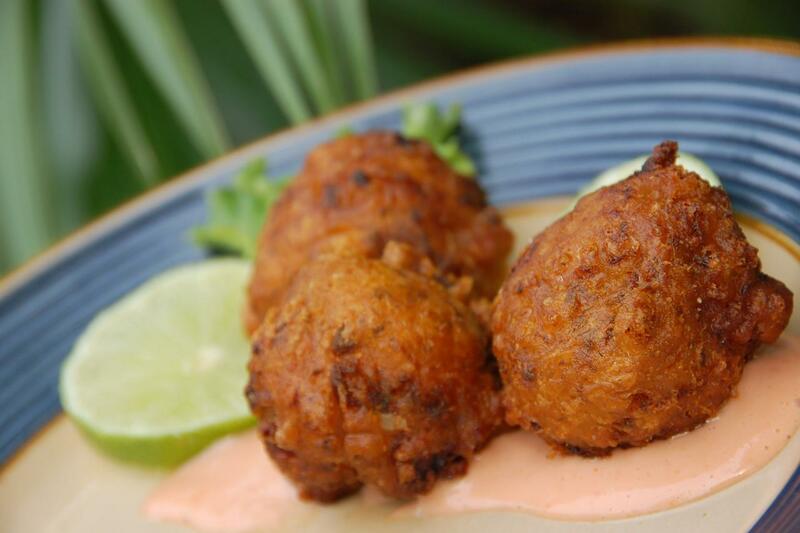 Conch fritters have a thick outer shell like hush puppies and taste great dipped in mayo, ketchup or a spicy jerk sauce. 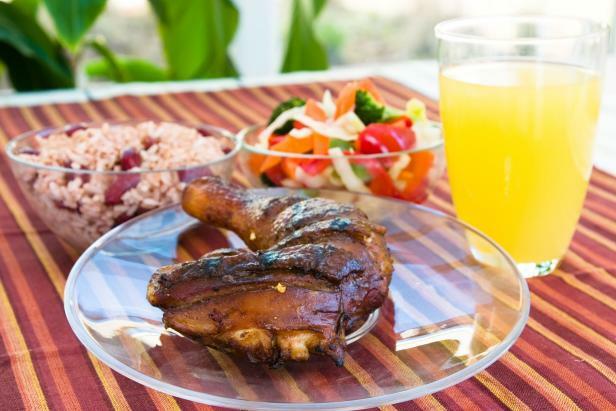 "Barbecued chicken leg also known as Jerk Chicken - Caribbean style served with vegetables, rice and lemonade. Shallow DOF." 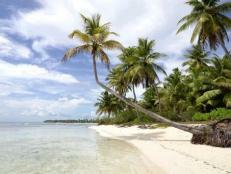 Cruisers come to port in Montego Bay and make a beeline to the beach. It’s tough with limited time, but for a real taste of the island, skip the beach and spend your handful of hours relaxing on the patio of a beachside restaurant. If you can take the heat, order a thigh and wing right off the grill. Rice and beans are a must and you’ll want to have some guava juice on hand to cool off. A fresh made Maine / New England lobster roll with mayonnaise, celery, butter, and lemon with a side of chips. Please see my portfolio for other food and drink images. 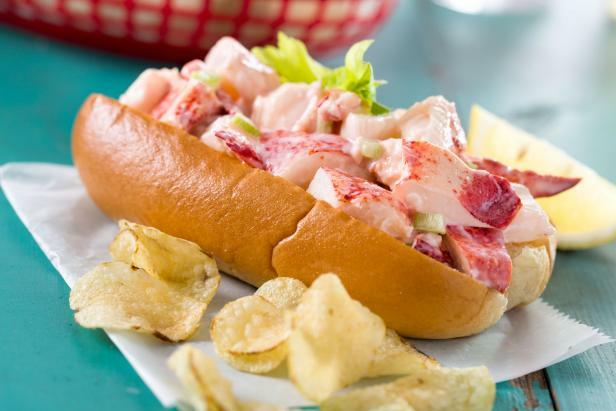 We can’t talk about coastal eats and not mention the lobster roll. It’s the epitome of beach snacks. From picnics to soaking up one too many beers, these sandwiches stuffed with butter-soaked goodness are satisfying and filling. Traditionally, they’re served in hotdog buns but these days you can find them in sandwich rolls and subs. While you can get this everywhere in London and throughout the United Kingdom, there’s nothing like enjoying a paper bowl of malt vinegar-soaked fried cod on the shore. Seriously, don’t hold back on the vinegar. Funky Brighton is a great English beach to start with and there’s direct train service from London. 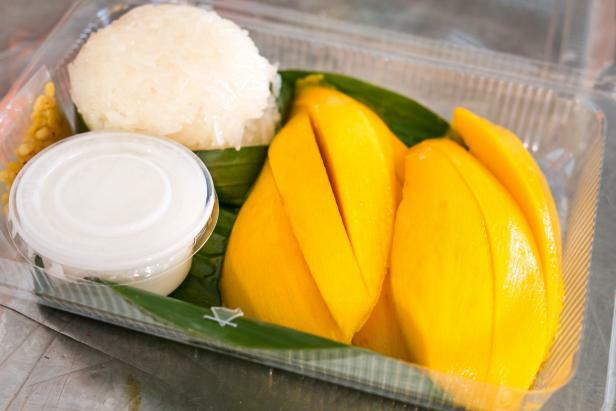 You’ve probably seen this dish on the dessert menu at your local Thai restaurant, but around Thailand’s islands, it’s a popular snack at the beach. Rice might seem messy but this snack is served with heaping amounts of sweetened coconut milk which act as a binding agent for the entire dish. It’s fruity, sweet and very filling. 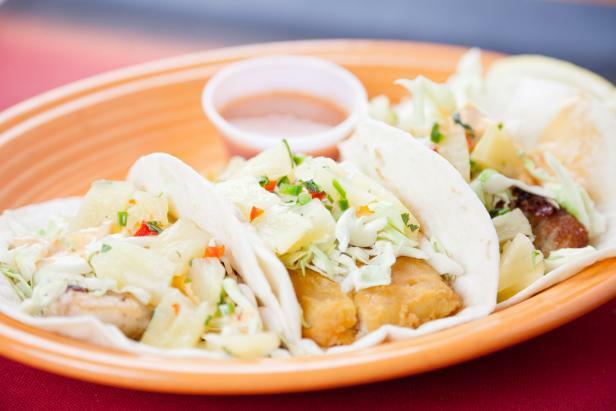 "Mexican food: three gourmet shrimp tacos in soft flour tortillas cooked with battered cod, grilled red snapper and grilled mahi-mahi. Served with pinapple salsa and pico de gallo. You might also be interested in this:"
You haven’t had fish tacos until you’ve had them in Baja. Fresh (like right off the boat), not fried and tossed with yummy slaw, this is how it should be. Squeeze a little lime and you’re good to go. 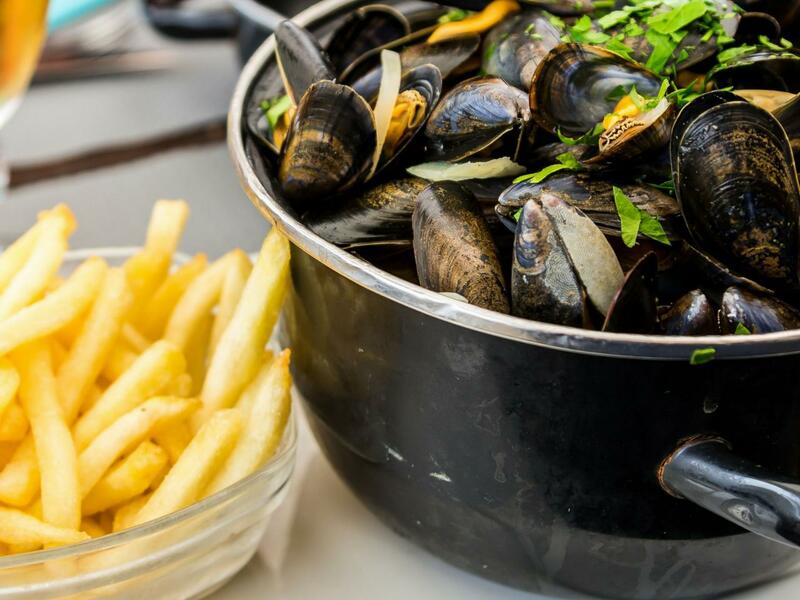 The combo of mussels and fries originated in Belgium but these days it’s everywhere seaside in the south of France. It’s a great afternoon snack to share as the portions are huge. Usually, the mussels come out in the pot they were cooked in. And that’s the way you want it. Dipping your fries in the garlic mussel juice is divine. 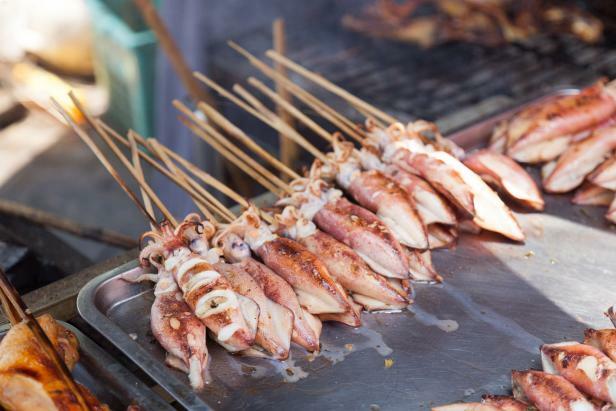 Freshly grilled squid on sticks at a barbecue grill, sold at the crab market in Kep, Cambodia. Love calamari? In Cambodia, fresh squid is a popular beach food but it’s less fried that what you see in the Mediterranean or the States. By less fried I mean it’s the whole body, grilled on a stick. Dipped in lime and chili sauce, it’s a great light snack. New York, NY, USA - August 30, 2016 : The Nathan's: The Nathan's original restaurant at Coney Island, The original Nathan's still exists on the same site that it did in 1916. What began as a nickel hot dog stand in 1916 is now a household name, thanks to the famous hotdog eating contest. 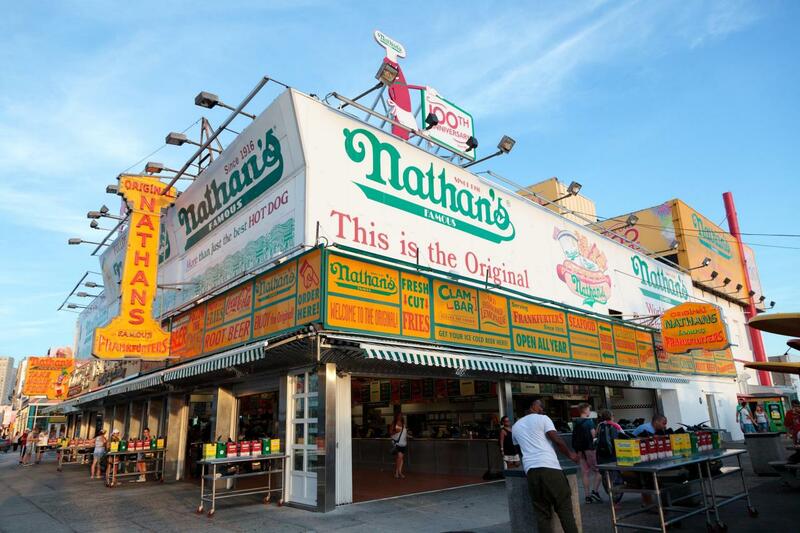 But the original stand is still in business, and visiting this boardwalk institution should be on every Coney Island bucket list. No, not shaved ice. 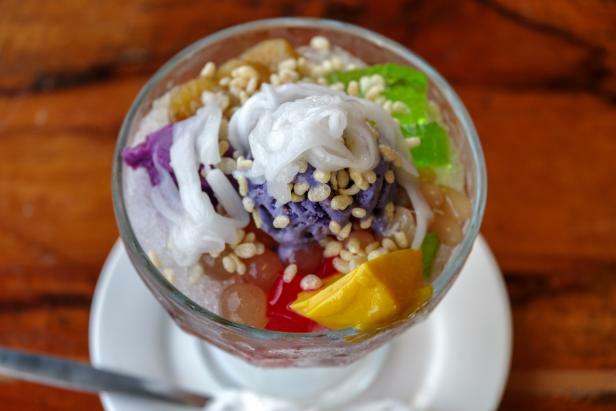 And not Hawaiian shaved ice. In Hawaii, it’s just “shave ice.” And I guarantee this is the smoothest icy treat you’ll ever have. No rock hard snow cones that break your teeth off. It’s fluffy like snow. The best part is the topping: sweetened condensed milk right from the can. A sprinkle of “mac” (macadamia) nuts is optional but not necessary. The cups are always huge and totally Instagrammable.